Scotti Bros./Rock n' Roll Records/Canyon Records, Inc. The enclosed liner note booklet features a bizarre cover that does not depict Al, but rather a red and blue design of the Olympic rings with smiley faces drawn inside them against a white background. Perhaps since 1984 was an Olympic year this cover idea seemed festive? The "Long Version" of "I Lost On Jeopardy" originally came from a 12" promo single in the United States. This and a German single are the only other releases the alternate mix has appeared on. The one brand new exclusive track is the "karaoke" version of "Eat It." Most likely used to help create the Japanese version of the song (which contains a new Japanese lead vocal...not done by Al! ), this version later showed up as a bonus track on the Japanese CD issue of The Food Album. 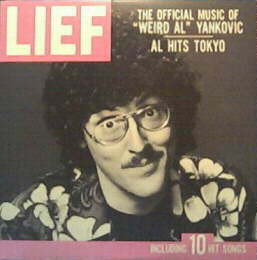 The subtitle "Al Hits Tokyo" appears underneath the main title on the album cover. For years it was assumed to be just part of the album's title. However, that phrase does not appear anywhere else on either the jacket, disc, or liner notes. It can be assumed that since the cover parodied the magazine Life, the subtitle was simply a caption that one may find on any of the publication's garden variety covers. This page was last updated September 11, 2006. The Official Music Of "Weird Al" Yankovic ©1984 Scotti Bros. Records/Canyon Records, Inc. ©1983, 1984 CBS, Inc.